In this episode I illustrate how you can use social media to earn +$20 per day without any investment or working more than 2 hours per day. It may be a very useful method for newbies & starters to finally get started and earn those first dollars. As I was browsing around various social media sites, I realized that almost everyone is obsessed with Instagram nowadays. 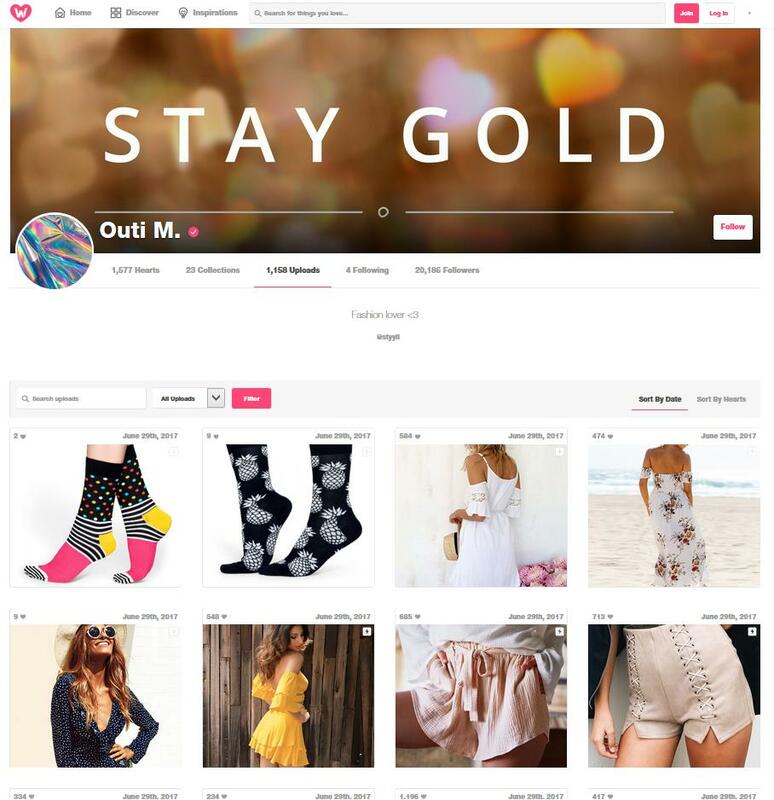 Many of us ignore the many smaller social sites such as “WeHeartIt”, which have a huge potential for selling fashion, clothing and accessory products. WeHeartIt falls in the same category as Pinterest, except that it has less competitors, somewhat less traffic but easier to get followers and grow your online business(es). On first sight this profile looks genuine and is most likely maintained by an individual person, thus it is not run by a bot or part of some company. Notice that they are not promoting any website or brand in particular. Many posts (but definitely not all) are having a very nice a mount of likes/hearts. But it’s funny and strange at the same time that some uploads have 500 hearts while others no more than 10 hearts, this may need more research to answer why. I then noticed that they are heart’ing (re-uploading) images from other eCommerce sites/brands, you can trace it back easily and they are not trying to hide this fact. Since their account has not been removed/banned for this behavior or sued by these brands, it means there is more going on here. Even back then the very first upload was taken from some eCommerce store. So if the owner(s) of this account are not running an own website/store and don’t own any of the products, it means they are most likely being paid for doing what they do. This definitely is no new method for earning money, but often times ignored making it quite easy to earn money for many years. If you have an account with over 20k followers, you can easily convince small eCommerce stores and brands to pay you for uploading & promoting their products. On June 29, 2017 this account has uploaded 20 images, assume they they get paid $1 per image/product they promote on their website that’s a $20 in the bank for almost no work at all ! One dollar is literally ‘nothing’ even for a small brand, I think we can agree on that. To make money through this method you have to have a good strategy and You need the followers to convince companies/brands to work with you. But even these people started with zero followers at first, so how can you do it? Well that’s easy to answer: build followers first. You can build followers in numerous ways, you can follow&unfollow other accounts and accumulate followers that way, or you can start doing “free” work. Get in touch with small eCommerce stores and ask if you may promote their products (because you are a fan). Don’t try to convince companies such as Amazon, Wall-Mart, Zara, Tommy Hilfiger — they won’t bother with small fish and they won’t care if they don’t know you. Once you have between 2000 and 5000 (which is doable to achieve in less than 1-2 months) then you can start contacting the same companies and charge $1 per upload. It’s important to start low and build your reputation so that they can start trusting you. One dollar is literally nothing, but if you limit yourself to 10-20 uploads every 2-3 days then you have a nice recurring side income to work on. It’s important to keep things “QUALITY ASSURED”, nobody is going to pay you if your profile looks sh*t and ugly. Also try to avoid the competitors of your clients, they won’t like you promoting items from their competitors and it makes your business/method look shady. Once you’ve successfully worked with a few clients for some weeks/months and they start seeing ROI/sales through your channel(s) then you can start charging more (e.g. $5 per post). If you are having trouble getting responses from potential clients/brands, then look for even smaller ones. The small ones are desperately looking for help in any way possible. It would even be very wise of you to work for free (7-14 days long) to gain their trust so that they can see you as an expert. Once they see you as the expert, they’ll be more willing to pay you. Also, you are saving them time and promoting their brand, meaning your service is SUPER valuable. The amount of work this method requires really takes no more than 20 seconds (just re-uploading some image). But it will take a few hours to reach out to (startup) companies/brands and ask for their cooperation with you. This case study was solely limited to WeHeartIt, but you can combine it with any other social network (Pinterest, Instagram, Facebook, Twitter, …). But as I mentioned earlier, it’s much easier to grow and go viral on smaller networks than larger ones. Start a “fan”-looking social profile on WeHeartIt (and/or other networks). Find 5-10 small start-up eCommerce stores which are not yet on your new social network (e.g. they don’t have a WeHeartIt profile). Make sure they have good products (not cheap & ugly). Make sure they are not drop-shipping or involved with affiliate programs — they must be the real brand owners. Finally contact them with a random question to make sure they reply and their support is good – if their support is bad then they’ll probably not give you any business. Start re-upload their images (5-20 per day max). Start building your followers (try various methods & techniques). Once you have reached 2-5k followers reach out to your eCommerce stores/brands and ask them to pay you $1 per post. Be professional and convince them as best you can. Once you have built up enough confidence and you start seeing your first dollars from this method, just scale it up and dominate.